The other day I was trying to copy or transfer music onto my old Nokia 300 phone. I checked with its user guide online. 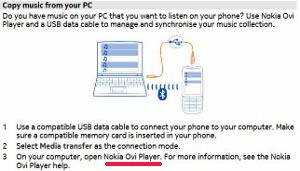 It says you to copy music from your PC, you need to use Nokia Ovi Player. 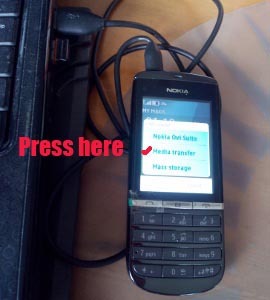 You DO NOT need to download the Nokia Ovi Player onto your computer, in order to transfer or copy MP3 music onto your Nokia 300 phone. 1. Firstly you need to get your music folder in MP3 format ready on your computer or PC. 2. Then you connect your USB data cable to both your Nokia phone and PC. 3. When you plug in your USB cable, you will get a menu pops up on your phone screen. 4. From the menu, select "Media transfer". 5. You do this by pressing on the small circle in front of "Media transfer". 6. Now go to your computer, and click on "Computer". 7. 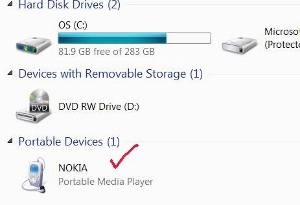 Now you see "NOKIA Portable Media Player" icon shown under "Portable Devices". 8. Next go where you have saved your music folder. 9. 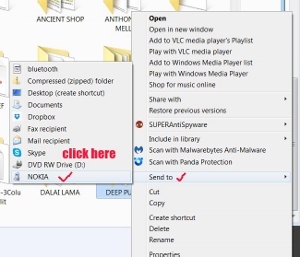 Right click on the folder. 10. A menu pops up. 11. Hover your cursor over "Send to", then move it over to "NOKIA". 13. It will start to copy or transfer all the music tracks onto your phone. 14. That's how to transfer music from PC to Nokio 300.